Tom Brady in 2015. Brady is the Patriots' only starting quarterback to have led the team to a Super Bowl victory, which he has done six times. There have been 28 starting quarterbacks in the history of the franchise. The most starting quarterbacks the Patriots have had in one season is five quarterbacks, in 1987. [a] Past quarterbacks for the Patriots include Patriots Hall of Fame inductees Babe Parilli, Steve Grogan, and Drew Bledsoe. Butch Songin became the first starting quarterback for the Patriots in 1960, when the franchise was first established. He was replaced by Tom Greene for the final two games of the season. Hall of Famer Parilli was the next starting quarterback for the Patriots, from 1961 to 1967. As of the 2017 season, New England's starting quarterback is Tom Brady, whom the Patriots selected in the 6th round (199th pick overall) of the 2000 NFL Draft. He is the only quarterback to have led the Patriots to a Super Bowl victory. Butch Songin became the first starting quarterback for the Patriots in 1960, when the franchise was first established. He started the first 12 games of the season, and Tom Greene replaced him as starting quarterback for the final two games. Babe Parilli was the next starting quarterback for the Patriots, from 1961 to 1967. In 1971, when the team moved to Foxborough and renamed from the "Boston Patriots" to the "New England Patriots", Jim Plunkett took over as quarterback. Plunkett started every regular season game for four straight seasons, until he was replaced by Steve Grogan as the starting quarterback in the 1975 season. Grogan was the only starting quarterback for six straight seasons, until Matt Cavanaugh started for four of the sixteen games in 1980. Grogan continued to start for the Patriots for parts of seasons until his retirement in 1990. Grogan finished his career with 135 games as starting quarterback, the second-most of any Patriots starting quarterback ever. From 1987 until 1993, the Patriots had no regular starting quarterback, with as many as five in one season, until Drew Bledsoe was drafted as the number one overall pick in the 1993 NFL Draft. Bledsoe led the team to four playoff appearances (1994, 1996, 1997, and 1998), two AFC East championships (1996 and 1997), and an AFC Championship (1997). Bledsoe was the team's primary starting quarterback for eight straight seasons until a hit by New York Jets linebacker Mo Lewis sheared a blood vessel in his chest, which put Bledsoe out for the rest of the 2001 season. Before the start of the 2002 season, Bledsoe was traded to the Buffalo Bills and did not get to see the opening of the new Gillette Stadium in September 2002. Tom Brady has led the team for more regular season games (267), postseason games (40), Super Bowl appearances (9), and complete seasons (15) than any other quarterback in franchise history. Brady's only incomplete seasons were 2001, when he replaced Bledsoe as the starting quarterback, 2008, when he suffered a season-ending knee injury in the first game of the regular season, and 2016 when he was suspended by the NFL for the first four games of the season as a result of the Deflategate incident. In 2008, Matt Cassel started the remaining 15 games, and despite missing the playoffs, the team finished with an 11–5 record and second place in the AFC East. In 2016, Jimmy Garoppolo served as the starting quarterback for the first two games of the season in Brady's absence before Garoppolo was injured and replaced by Jacoby Brissett. Brady also has led the team to all six of the franchise's Super Bowl victories, doing so in 2001, 2003, 2004, 2014, 2016 and 2018. He is one of only four Patriots quarterbacks to have started at Gillette Stadium, the others having been Cassel, Garoppolo, and Brissett. Steve Grogan has started the second-most games in franchise history (135), 116 games fewer than Brady. Having been the starting quarterback for the past 17 seasons, Tom Brady holds the record for the most starts in a Patriots jersey, as well as for the most overall wins. He is also the franchise leader in attempts, completions, total yards gained, and passing touchdowns, although Jimmy Garoppolo has the best pass completion percentage. Brady also holds the record for the longest completed pass by a Patriots starting quarterback, throwing a 99-yard touchdown pass to wide receiver Wes Welker in an away game against the Miami Dolphins during the 2011 season. Brady is also the leader in rushing attempts, but Steve Grogan has the most rushing yards and rushing touchdowns. Tom Yewcic holds the record for the longest rush with a 46-yard run in the Patriots' 14–10 road loss to the Denver Broncos during the 1963 season. a In each game, a team picks one player to start in the quarterback position. Players may be substituted during the game, but the term "starting quarterback" refers to the player who started the game in that position. "New England Patriots Team Encyclopedia". Pro-Football-Reference.com. Sports Reference. Retrieved July 30, 2017. ^ "Boston Patriots". Pro Football Hall of Fame. Retrieved May 13, 2008. ^ a b "New England Patriots Hall of Famers". New England Patriots. Retrieved August 1, 2017. ^ a b c "1960 Boston Patriots Statistics & Players". Pro Football Reference. Sports Reference LLC. Retrieved December 6, 2009. ^ a b c "Babe Parilli Statistics". Pro Football Reference. Sports Reference LLC. Retrieved March 8, 2015. ^ a b "1971 New England Patriots Statistics & Players". Pro Football Reference. Sports Reference LLC. Retrieved December 6, 2009. ^ a b "Jim Plunkett Statistics". Pro Football Reference. Sports Reference LLC. Retrieved March 8, 2015. ^ a b "1975 New England Patriots Statistics & Players". Pro Football Reference. Sports Reference LLC. Retrieved December 6, 2009. ^ a b "1980 New England Patriots Statistics & Players". Pro Football Reference. Sports Reference LLC. Retrieved December 6, 2009. 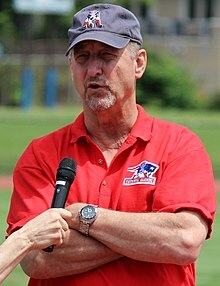 ^ a b c d e f g "Steve Grogan Statistics". Pro Football Reference. Sports Reference LLC. Retrieved March 8, 2015. ^ a b "1993 New England Patriots Statistics & Players". Pro Football Reference. Sports Reference LLC. Retrieved December 6, 2009. ^ a b c d e f "Drew Bledsoe Statistics". Pro Football Reference. Sports Reference LLC. Retrieved March 8, 2015. ^ a b "1994 New England Patriots Statistics & Players". Pro Football Reference. Sports Reference LLC. Retrieved December 6, 2009. ^ a b "1996 New England Patriots Statistics & Players". Pro Football Reference. Sports Reference LLC. Retrieved December 6, 2009. ^ a b "1997 New England Patriots Statistics & Players". Pro Football Reference. Sports Reference LLC. Retrieved December 6, 2009. ^ a b "1998 New England Patriots Statistics & Players". Pro Football Reference. Sports Reference LLC. Retrieved December 6, 2009. ^ a b c d e f g h i j k l m n o p q r s t "Tom Brady Statistics". Pro Football Reference. Sports Reference LLC. Retrieved March 8, 2015. ^ a b "2001 New England Patriots Statistics & Players". Pro Football Reference. Sports Reference LLC. Retrieved December 6, 2009. ^ "Brady to have season-ending knee surgery, will be placed on IR". NFL.com. National Football League. September 9, 2008. Retrieved March 8, 2015. ^ "Appeals Court: Tom Brady must serve Deflategate punishment". Associated Press. April 26, 2016. Retrieved September 6, 2017. ^ a b "2008 New England Patriots Statistics & Players". Pro Football Reference. Sports Reference LLC. Retrieved December 6, 2009. ^ "New England Patriots". Pro-Football-Reference. Sports Reference LLC. Retrieved March 15, 2015. ^ "1961 Boston Patriots Statistics & Players". Pro Football Reference. Sports Reference LLC. Retrieved December 6, 2009. ^ "1962 Boston Patriots Statistics & Players". Pro Football Reference. Sports Reference LLC. Retrieved December 6, 2009. ^ "1963 Boston Patriots Statistics & Players". Pro Football Reference. Sports Reference LLC. Retrieved December 6, 2009. ^ "1964 Boston Patriots Statistics & Players". Pro Football Reference. Sports Reference LLC. Retrieved December 6, 2009. ^ "1965 Boston Patriots Statistics & Players". Pro Football Reference. Sports Reference LLC. Retrieved December 6, 2009. ^ "1966 Boston Patriots Statistics & Players". Pro Football Reference. Sports Reference LLC. Retrieved December 6, 2009. ^ "1967 Boston Patriots Statistics & Players". Pro Football Reference. Sports Reference LLC. Retrieved December 6, 2009. ^ "1968 Boston Patriots Statistics & Players". Pro Football Reference. Sports Reference LLC. Retrieved December 6, 2009. ^ "1969 Boston Patriots Statistics & Players". Pro Football Reference. Sports Reference LLC. Retrieved December 6, 2009. ^ "1970 Boston Patriots Statistics & Players". Pro Football Reference. Sports Reference LLC. Retrieved December 6, 2009. ^ "1972 New England Patriots Statistics & Players". Pro Football Reference. Sports Reference LLC. Retrieved December 6, 2009. ^ "1973 New England Patriots Statistics & Players". Pro Football Reference. Sports Reference LLC. Retrieved December 6, 2009. ^ "1974 New England Patriots Statistics & Players". Pro Football Reference. Sports Reference LLC. Retrieved December 6, 2009. ^ "1976 New England Patriots Statistics & Players". Pro Football Reference. Sports Reference LLC. Retrieved December 6, 2009. ^ "1977 New England Patriots Statistics & Players". Pro Football Reference. Sports Reference LLC. Retrieved December 6, 2009. ^ "1978 New England Patriots Statistics & Players". Pro Football Reference. Sports Reference LLC. Retrieved December 6, 2009. ^ "1979 New England Patriots Statistics & Players". Pro Football Reference. Sports Reference LLC. Retrieved December 6, 2009. ^ "1981 New England Patriots Statistics & Players". Pro Football Reference. Sports Reference LLC. Retrieved December 6, 2009. ^ "1982 New England Patriots Statistics & Players". Pro Football Reference. Sports Reference LLC. Retrieved December 6, 2009. ^ "1983 New England Patriots Statistics & Players". Pro Football Reference. Sports Reference LLC. Retrieved December 6, 2009. ^ "1984 New England Patriots Statistics & Players". Pro Football Reference. Sports Reference LLC. Retrieved December 6, 2009. ^ "1985 New England Patriots Statistics & Players". Pro Football Reference. Sports Reference LLC. Archived from the original on December 24, 2008. Retrieved December 6, 2009. ^ "1986 New England Patriots Statistics & Players". Pro Football Reference. Sports Reference LLC. Retrieved December 6, 2009. ^ "1987 New England Patriots Statistics & Players". Pro Football Reference. Sports Reference LLC. Retrieved December 6, 2009. ^ "1988 New England Patriots Statistics & Players". Pro Football Reference. Sports Reference LLC. Retrieved December 6, 2009. ^ "1989 New England Patriots Statistics & Players". Pro Football Reference. Sports Reference LLC. Retrieved December 6, 2009. ^ "1990 New England Patriots Statistics & Players". Pro Football Reference. Sports Reference LLC. Retrieved December 6, 2009. ^ "1991 New England Patriots Statistics & Players". Pro Football Reference. Sports Reference LLC. Retrieved December 6, 2009. ^ "1992 New England Patriots Statistics & Players". Pro Football Reference. Sports Reference LLC. Retrieved December 6, 2009. ^ "1995 New England Patriots Statistics & Players". Pro Football Reference. Sports Reference LLC. Retrieved December 6, 2009. ^ "1999 New England Patriots Statistics & Players". Pro Football Reference. Sports Reference LLC. Retrieved December 6, 2009. ^ "2000 New England Patriots Statistics & Players". Pro Football Reference. Sports Reference LLC. Retrieved December 6, 2009. ^ "2002 New England Patriots Statistics & Players". Pro Football Reference. Sports Reference LLC. Retrieved December 6, 2009. ^ "2003 New England Patriots Statistics & Players". Pro Football Reference. Sports Reference LLC. Retrieved December 6, 2009. ^ "2004 New England Patriots Statistics & Players". Pro Football Reference. Sports Reference LLC. Retrieved December 6, 2009. ^ "2005 New England Patriots Statistics & Players". Pro Football Reference. Sports Reference LLC. Retrieved December 6, 2009. ^ "2006 New England Patriots Statistics & Players". Pro Football Reference. Sports Reference LLC. Retrieved December 6, 2009. ^ "2007 New England Patriots Statistics & Players". Pro Football Reference. Sports Reference LLC. Retrieved December 6, 2009. ^ "2009 New England Patriots Statistics & Players". Pro Football Reference. Sports Reference LLC. Retrieved December 6, 2009. ^ "2010 New England Patriots Statistics & Players". Pro Football Reference. Sports Reference LLC. Retrieved September 12, 2010. ^ "2011 New England Patriots Statistics & Players". Pro Football Reference. Sports Reference LLC. Archived from the original on January 27, 2012. Retrieved September 13, 2011. ^ "2012 New England Patriots Statistics & Players". Pro Football Reference. Sports Reference LLC. Retrieved September 13, 2012. ^ "2013 New England Patriots Statistics & Players". Pro Football Reference. Sports Reference LLC. Retrieved September 14, 2013. ^ "2014 New England Patriots Statistics & Players". Pro Football Reference. Sports Reference LLC. Retrieved October 25, 2014. ^ "2015 New England Patriots Statistics & Players". Pro Football Reference. Sports Reference LLC. Retrieved October 5, 2015. ^ "2016 New England Patriots Statistics & Players". Pro Football Reference. Sports Reference LLC. Retrieved September 11, 2016. ^ "2017 New England Patriots Statistics & Players". Pro Football Reference. Sports Reference LLC. Retrieved September 10, 2017. ^ "2018 New England Patriots Statistics & Players". Pro Football Reference. Sports Reference LLC. Retrieved September 9, 2018. ^ a b c "Tony Eason Statistics". Pro Football Reference. Sports Reference LLC. Retrieved March 8, 2015. ^ a b "Scott Zolak Statistics". Pro Football Reference. Sports Reference LLC. Retrieved March 8, 2015. ^ a b c "New England Career Passing Register". Pro-Football-Reference.com. Sports Reference. Retrieved August 4, 2017. ^ "New England Patriots at Miami Dolphins – September 12th, 2011". Pro-Football-Reference.com. Sports Reference. Retrieved August 4, 2017. ^ a b "New England Patriots Career Rushing Register". Pro-Football-Reference.com. Sports Reference. Retrieved August 4, 2017. ^ "Boston Patriots at Denver Broncos – September 29th, 1963". Pro-Football-Reference.com. Sports Reference. Retrieved August 4, 2017. ^ "Mike Taliaferro Statistics". Pro Football Reference. Sports Reference LLC. Retrieved March 8, 2015. ^ "Hugh Millen Statistics". Pro Football Reference. Sports Reference LLC. Retrieved March 8, 2015. ^ "Butch Songin Statistics". Pro Football Reference. Sports Reference LLC. Retrieved March 8, 2015. ^ "Matt Cassel Statistics". Pro Football Reference. Sports Reference LLC. Retrieved March 8, 2015. ^ "Matt Cavanaugh Statistics". Pro Football Reference. Sports Reference LLC. Retrieved March 8, 2015. ^ "Doug Flutie Statistics". Pro Football Reference. Sports Reference LLC. Retrieved March 8, 2015. ^ "Tommy Hodson Statistics". Pro Football Reference. Sports Reference LLC. Retrieved March 8, 2015. ^ "Joe Kapp Statistics". Pro Football Reference. Sports Reference LLC. Retrieved March 8, 2015. ^ "Marc Wilson Statistics". Pro Football Reference. Sports Reference LLC. Retrieved March 8, 2015. ^ "Tom Sherman Statistics". Pro Football Reference. Sports Reference LLC. Retrieved March 8, 2015. ^ "Tom Yewcic Statistics". Pro Football Reference. Sports Reference LLC. Retrieved March 8, 2015. ^ "Scott Secules Statistics". Pro Football Reference. Sports Reference LLC. Retrieved March 8, 2015. ^ "Tom Ramsey Statistics". Pro Football Reference. Sports Reference LLC. Retrieved March 8, 2015. ^ "Don Trull Statistics". Pro Football Reference. Sports Reference LLC. Retrieved March 8, 2015. ^ "Bob Bleier Statistics". Pro Football Reference. Sports Reference LLC. Retrieved March 8, 2015. ^ "Jacoby Brissett Statistics". Pro Football Reference. Sports Reference LLC. Retrieved August 4, 2017. ^ "Jimmy Garoppolo Statistics". Pro Football Reference. Sports Reference LLC. Retrieved August 4, 2017. ^ "Jeff Carlson Statistics". Pro Football Reference. Sports Reference LLC. Retrieved March 8, 2015. ^ "Neil Graff Statistics". Pro Football Reference. Sports Reference LLC. Retrieved March 8, 2015. ^ "Tom Greene Statistics". Pro Football Reference. Sports Reference LLC. Retrieved March 8, 2015. ^ "Eddie Wilson Statistics". Pro Football Reference. Sports Reference LLC. Retrieved March 8, 2015. ^ "Tom Owen Statistics". Pro Football Reference. Sports Reference LLC. Retrieved March 8, 2015. ^ "NFL History by Decade, 1971–1980". NFL.com. National Football League. Archived from the original on April 2, 2007. Retrieved November 4, 2009. ^ "NFL History by Decade, 1981–1990". NFL.com. National Football League. Retrieved November 4, 2009.